The young girl's sudden frailty and agony puzzled and frightened her family.That was in 2014, when Lydia was 6 years old and diagnosed with acute flaccid myelitis, or AFM, a rare but serious polio-like neurological illness that affects the brain and nervous system.Symptoms can include sudden limb weakness, loss of muscle tone and reflexes, facial and eyelid drooping, difficulty moving the eyes, difficulty swallowing or slurred speech, according to the US Centers for Disease Control and Prevention. "The most severe symptom of AFM is respiratory failure that can happen when the muscles involved with breathing become weak. This can require urgent ventilator support (breathing machine). In very rare cases, it is possible that the process in the body that triggers AFM may also trigger other serious neurologic complications that could lead to death," according to the CDC.Now, at 10 years old, Lydia has some lingering weakness in her arm, but overall, "she is really leading a wonderful life at this point in time," said her mother, Dr. Sarah Pilarowski, a pediatrician in the Denver area. "A lot of times I ask, 'Why me?' But then a lot of times, I'm like, 'at least it wasn't in my legs or my right hand,' because I'm right-handed, so that would be a lot worse," Lydia said.Lydia hopes to serve as a beacon of hope for a growing number of people in the United States — mostly children — who have been diagnosed with the condition.As of September 30, there have been 38 confirmed cases of AFM in 16 states nationwide this year, according to the CDC. The numbers appear to be rising, with several additional cases recently hitting Illinois, Colorado, Washington and Minnesota. Since August 2014, when the CDC began tracking the illness more closely, the agency has confirmed 362 cases.Last year, 33 cases were reported in 16 states. One hundred forty-nine cases were reported in 39 states in 2016 and 22 cases in 17 states in 2015.There are several possible causes of AFM, such as viruses, environmental toxins and genetic disorders. The culprit behind Lydia's AFM was an enterovirus, a common type of virus that typically increases in summer and fall. 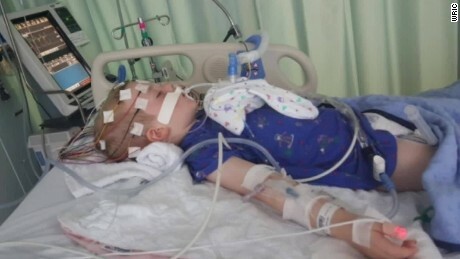 "The most common etiology is probably a viral infection that starts off the process, and there's probably several different viruses that can cause acute flaccid myelitis," said Dr. Samuel Dominguez, medical director of the clinical microbiology laboratory at Children's Hospital Colorado, who was involved in Lydia's care. "In the older days, polio myelitis would've been one of the most common causes of acute flaccid myelitis, but thankfully, we don't see polio anymore in this country due to our vaccine program. But other viruses like enterovirus A71 and West Nile virus, Japanese encephalitis virus, and we think now enterovirus D68 is probably also another cause of acute flaccid myelitis," Dominguez said. "Depending on which virus is causing it, often, it will start — if it's enterovirus D68 — it will start with a respiratory illness and a fever, and then several days later, children will experience a fever or a headache and neck pain, or pain in their arm or leg, and that will sort of progress to weakness, so they won't be able to move their arm or leg as well," he said. It was a pleasant day in August 2014 when Lydia started coughing, showing her firstsigns of illness.Yet her mother didn't quite realize how serious Lydia's illness was until she observed her daughter playing the piano one day. "She was playing the right hand just fine, and then it came time for her to play her left hand, but instead of pushing the keys down with her left hand, she had her left hand in position, but she reached over with her right hand and used her right hand to push her left-hand fingers down on the keys," Pilarowski said. "I said, 'Well, Lydia, why are you doing that? Why aren't you using your left hand to push down those keys?' And, 'Well, Mom, I can't. I can't play the piano with my left hand.' And that was sort of the first inkling that there was really something majorly wrong. "There is no specific treatment for AFM, but treatments that have been tried include immunoglobulin replacement therapy, corticosteroids, plasma exchange and antiviral therapy, according to the National Institutes of Health.Physical therapy and occupational therapy are especially important during recovery; both helped Lydia heal. "The muscle strength that she regained directly in her affected arm, it just sort of seemed to come back on its own. The therapies really helped some of the surrounding muscles so that she could find new ways to do things, and she definitely has done that. She's figured out new ways to do things," Pilarowski said. "There is a wide spectrum, and Lydia's a little bit more mild on the spectrum," she said of AFM. All in all, she added, "I want to give families hope who are in the midst of it right now, because certainly, when we were in the midst of Lydia's acute illness, we didn't know what was going to happen."